Here at Colorado Firebreak we are proud to offer the homeowner a simple do-it-yourself fire retardant spray option that offers an effective, but more limited defense than our full wildfire mitigation system. That solution is the FireIce® Home Defense Unit™. This unit(2600 PSI/2.3 Gallons Per Minute) is ideal for homeowners with homes smaller than 5,000 sq. feet. Utilizing the revolutionary FireIce® gel, the HMU can safeguard structures for up to 24 hours and protect from heat as high as 2,000 degrees Fahrenheit. • FireIce® adheres to many different types of structures including Wood, Stucco, & Brick. • FireIce® adds lasting protection to your shrubs, trees & surrounding landscape. FireIce® is easy to clean up. 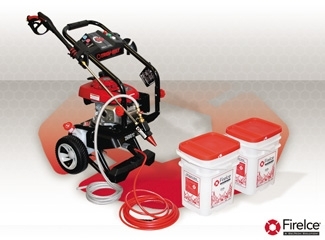 No pressure cleaning or harsh chemicals are needed to remove FireIce®, only a garden hose. FireIce is not only innovative in its fire-fighting technology, it’s also environmentally friendly. FireIce is an all-natural product that cleans up by simply washing it off with water. It is nontoxic, and does not damage plants or wildlife. Plus, it’s safe for use around pets and children. Included with the FireIce® HDU are two buckets of FireIce®. Each bucket will provide 1,250 sq. ft of coverage. Additional buckets of FireIce® may be purchased as needed. The FireIce® HDU sells for only $1,499.99. Contact Us today to order your Home Defense Unit.